In 514 B.C., Rome overthrew her Etruscan King, Tarquin the Proud. As the revolt spread through Latium, Lars Porsena, Etruscan King of Clusium, marched on Rome at the head of a large army of Etruscans and allies. Although they knew of the threat, the Romans were caught unaware; and Rome fell to the Etruscans. As Porsena's army continued through the Latin territory, he was finally caught between the armies of Latium and the Greeks of Cumae. 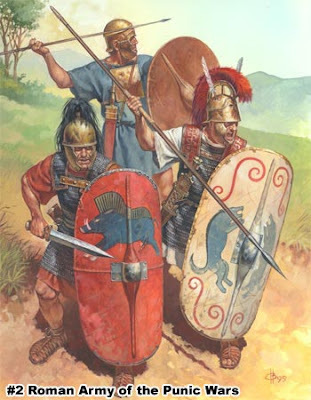 The two forces crushed the Etruscan army, which was forced to retreat. In 58 B.C., Julius Caesar began the first of three campaigns which resulted in the conquest of Gaul. The army had undergone major reforms under Marius and was now the greatest military force the world had ever seen. During the 2nd and 3rd Centuries A.D., mass migrations from Eurasia put constant pressure on the European frontier. 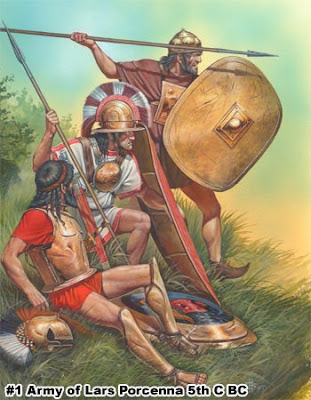 In Mesopotamia, the Parthians and Sassinids attacked the frontiers; and in 260 A.D., the Sassinids defeated a Roman army at Edessa. The Roman Emperor Valerian was killed and up to 25,000 Romans were captured and sold as slaves. By 350 A.D., the Roman army was closer in appearance to their enemies and former enemies than to the Imperial Roman troops of Trajan. Much of this change was due to the fact that the legions were made up of men recruited in the provinces rather than Rome and Italy. 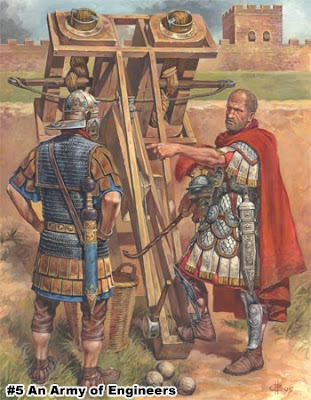 The Romans were excellent engineers in all areas of military endeavor. They were practical and methodical in their planning and project execution. The legions were constantly employed in building projects such as roads, aqueducts, fortifications, and all types of buildings. They were also masters of siege warfare. The siege of Alesia by Julius Caesar and the siege of Jerusalem in 70 A.D. are two well-known examples. During the 1st Century A.D., each legion was assigned about 55 pieces of artillery. These were both bolt-shooting machines and stone throwers. These engines were able to hurl their missiles or rocks up to half a mile. Between 514 B.C. and 284 B.C., Rome fought numerous wars with her neighbors. As the chief partner of the Latin League, Rome led the armies that eventually conquered the Etruscans, the Samnites and even Pyrrhus, king of Epirus. Pyrrhus had invaded Italy with an army of 25,000 Macedonians and 20 elephants. His ‘‘Pyrric Victories" eventually led to his retreat back to Epirus. 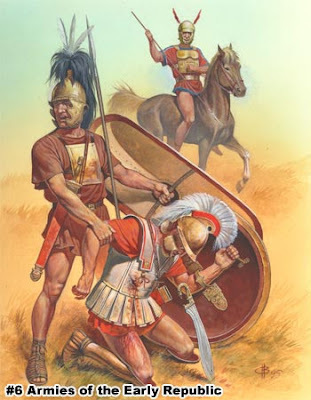 Interestingly, the Carthaginians had fought Pyrrhus during this same period which made Rome and Carthage distant allies. The end of the Pyrrhic war found Rome in command of southern Italy and a top military power in the Mediterranean. Under Trajan, the Romans invaded and eventually annexed Dacia to the east of the Danube River. After the virtual annihilation of two legions, it was not possible to hold this area; and the Romans soon retreated behind the natural defensive barrier of the Danube. A series of fortifications were built which were mutually supportable and manned by auxiliary troops with legions stationed strategically behind the frontier to react to any incursions by enemy tribesmen. In some areas, a ditch and vallum was constructed, but this was not a continuous defensive line. At the height of its power in about 115 A.D., the empire of Rome stretched from northern England to southern Iraq. Rome controlled all the land around the Mediterranean. The empire included modern day Egypt, Greece, Spain, France, Turkey, Syria, and much more. In 9 A.D., three Roman legions were wiped out in the Teutoburg Forest. Operations to the east of the Rhine were limited following this disastrous defeat. A series of fortifications were built establishing a defensive line called the "Limes". The small group depicted here has been caught outside their fort and awaits their fate. 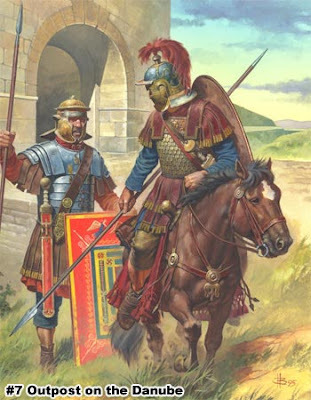 Up to 60,000 cavalry were used at any given time between the 1st and 4th Centuries A.D. Cavalry forts were an integral part of Roman defenses such as Hadrian's wall. The ability to scout and raid into enemy territory, as well as quick response to enemy raids, made cavalry more and more important. After the second half of the 2nd Century B.C., Roman cavalry was all recruited from the conquered territories. 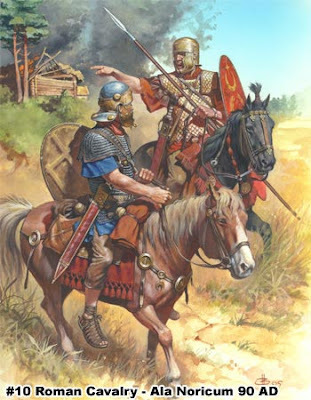 Roman officers commanded the "alae" cavalry regiments, which were about 500 strong. The force was further divided into 16 "turmae", each commanded by a Decurion. 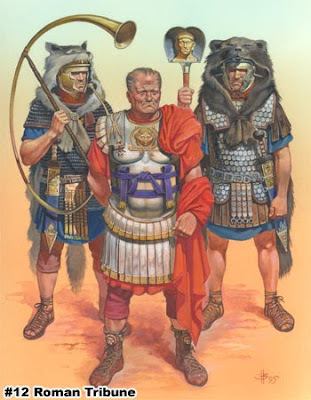 The Roman Empire frontiers were guarded by a maximum of 33 Imperial Legions numbering no more than 150,000 men. 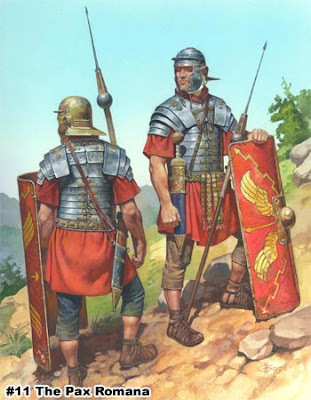 There were up to 175,000 auxiliary troops serving Rome at the same time. 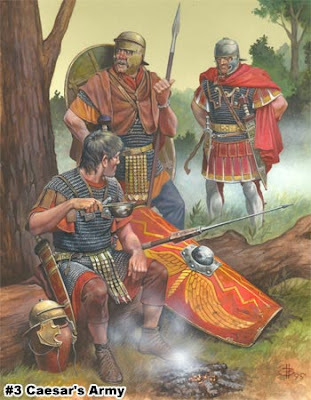 After about 115 A.D., there was fighting to hold the defensive lines; but within the empire’s borders, the "Pax Romana" ensured relative peace and tranquility. The Roman Imperial Army was the most ruthless and efficient killing machine produced in the ancient world. Rome came to conquer most of the world known to her, through the combination of ferocity, skill and logistics. The training of a legionary was intense and practical. By the time a recruit’s training was completed, he had learned how to deliver a blow without opening for a counter, with an emphasis on the lethal thrusting strokes. 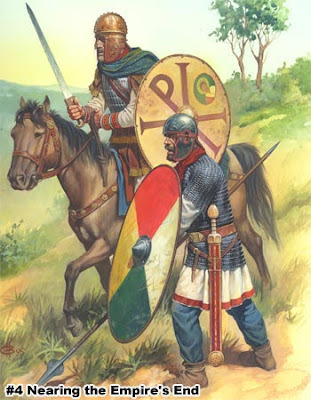 Armed with his "gladius" (originally a Spanish, short stabbing sword), the legionary was virtually a professional swordsman. 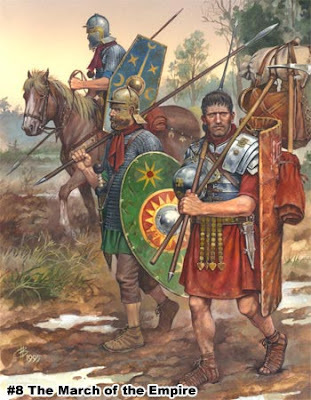 The Romans normally marched 20 miles in a day, with each man carrying up to 60 pounds of gear. An elaborate and fortified camp was constructed at the end of each day’s march.